Pokemon I Choose You released on the 15th of July 2017 and was the latest installment in the Pokemon movie franchise until the release of Pokemon The Power Of Us quite recently. I Choose You! takes us back to Ash’s first days as a Pokemon trainer and begins off in Pallet Town in the Kanto region, with Ash being late to Professor Oak’s lab and missing Charmander, Squirtle and Bulbasaur, but getting Pikachu instead. The movie is a retelling of the beginning of the anime and runs for 1 hour and 38 minutes. Keep In Mind that I will not be straying from spoilers in this review as this movie is over 1 year old, however I will not include major spoilers. I am particularly impressed by how the movie not only retells the original kanto journey but also weaves back in a once-long-abandoned plot point with Ho-Oh. The nostalgia they created by chucking us back into the original anime with a previously unexplored plot line was great and it didn’t step on the shows toes and mess up continuity which was a great plus. While weaving the new hotness with Marshadow in felt a bit forced in some aspects, the story was paced well and even had some tension at the climax that ultimately was resolved not with raw strength, but by the bond between Ash and Pikachu overcoming those odds. Overall, all that occurred worked quite well even if some of the older parts were abridged for the sake of moving the story along. First off, Ash’s design seems more in line with his Gen V and Gen VI designs which is a nice change from the excessively cartoonish art style I’ve seen from his Sun and Moon exploits. And the character designs of the supporting cast are definitely quite something as well. Secondly, I like how they played around with color and shadows, adding atmosphere and life (or lack thereof) to the film. Not breathtaking or anything, but it worked well (and better than the cartoony Sun and Moon anime). Ash holding the rainbow feather with Pikachu in Pokemon I Choose You! Not much to note here except for the throwback to the Kanto and original pokemon theme of Gotta Catch Them All. Probably one of the only songs that survives my music playlist purges every year. The original theme brings back a lot of nostalgia in this installment and I loved every bit of its usage. Besides Ash and Pikachu’s obvious OTP-in-the-making, the other supporting cast actually kept my interest. His traveling companions, both from Sinnoh (Gen IV remake, anyone? ), each have their own goals independent from Ash. The female one is determined to show her mother (who I am convinced is Cynthia) that she is worth something, and the male companion is a professor wannabe and seems to be quite knowledgeable in a few things as it is. Then you have the brutish ‘rival’ character who has Alolan pokemon and the conviction that might makes right in direct opposition to Ash’s ‘friendship is magic’ policy. In any case, I would’ve loved to see more of these characters and learn their past as well as witness their continued growth in the future. Who knows if that’ll happen though. As for the pokemon, again, Pikachu is the center as a support to Ash. We finally learn why it doesn’t like to be in its pokeball (which Ash had carried with him all through the film), and they take things a few steps further than they had ever done in the series with their relationship up to this point. As for the other pokemon, the butterfree plot thread becomes a side-story that kind of resolves itself with less investment than the original, whereas the Charmander sideplot comes full-circle in the best way possible. Then there’s Marshadow, which again I feel they did kinda push in for…reasons. Maybe would’ve been better in its own movie, but I guess they saw an opportunity of sorts. It was definitely worth watching. Most pokemon films are just a supplement to the anime, but this effort of retelling and revamping made the Kanto region seem a lot more vast and alive than the prior time around. 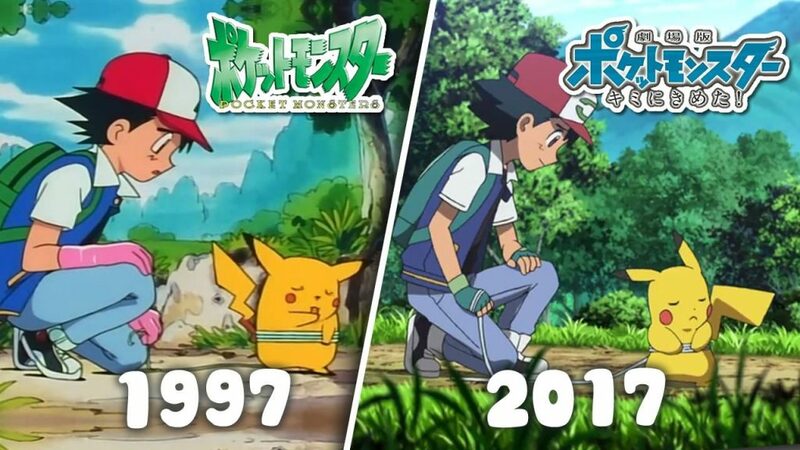 I loved re-watching Ash journey through Kanto for the first time, albeit without Brock and Misty, but even without them it was still a great journey. I definitely recommend watching it if you’re a Pokemon fan. Even if you aren’t, the story of Ash and Pikachu is definitely something worth picking up, both the show and this movie. Ash’s new companions and rival in Pokemon I Choose You!